Happy Love Day to everyone. This is always a special day for Nathan and I because on our first Valentine’s Day as a couple, he really did things right. Unfortunately, because of that first Valentine’s Day, pretty much anything short of a new car or a trip to Italy just won’t compare. I am exaggerating a little bit, but not a year goes by that we don’t talk about that first holiday together and how perfect it was. This year, our Valentine’s Day weekend started off with 2 lbs. of bacon and a whole bunch of chocolate. My work has an annual chocolate festival and each year I try to bring something just a little bit strange. I used to bring chocolate covered saltine crackers which are always great. Last year I took chipotle chocolate covered potato chips. This year, I decided to go hog wild! Just kidding. I saw chocolate bacon on the Food Network a few months back and I made a mental note for this year’s chocolate festival. So, when I got home Thursday night, I cooked up a bunch of thick cut bacon, let it cool, dipped it in warm melted semi-sweet chocolate chips and sprinkled it with walnuts. The result isn’t anything too amazing, but it’s pretty good. It has that salty, sweet goodness going on for sure. I probably won’t make it again since it’s … well … not the healthiest thing in the world. As a matter of fact, it’s so unhealthy that I limited myself to one piece. 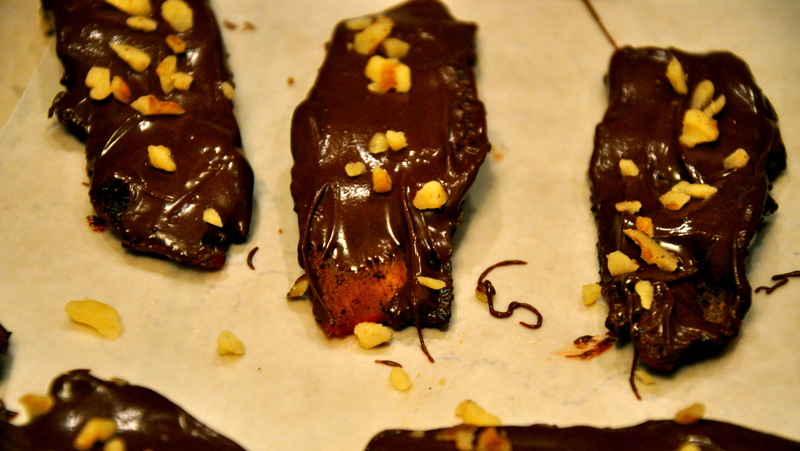 I couldn’t risk falling in love with chocolate covered bacon, it’s just too dangerous. 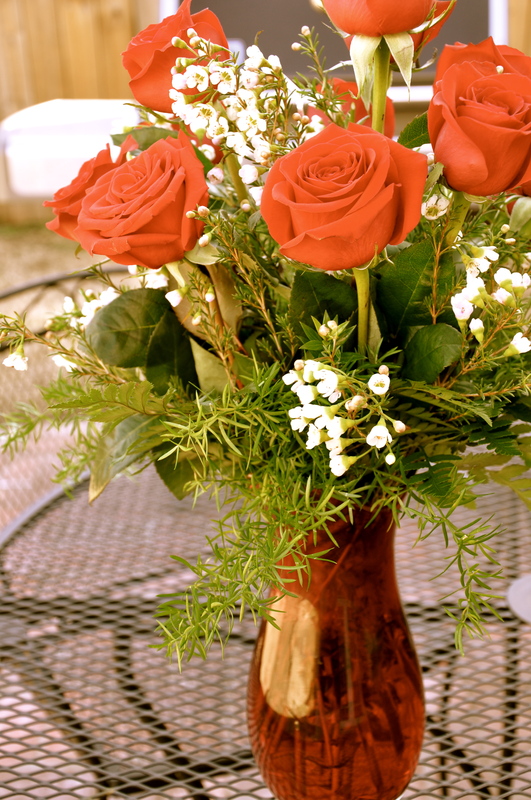 Nathan also surprised me on Friday with these beautiful flowers. He’s thoughtful like that and I’m thankful. I’m not nearly as organized as Nathan. Our first Valentine’s Day after we got married was a busy one. Nathan delivered flowers to me at work that morning. I then worked late and ran into Wal-Mart on my way home to grab a card and some candy for him. When I got home, I hurried to sign the card and set the candy on the counter before Nathan walked into the kitchen. I was so proud I had managed to get both a card and candy. I watched as Nathan read the words of love I had so thoughtfully added to the card. His expression wasn’t what I expected . He seemed to be looking at me to see if I was going to laugh or say something. “What?” I said exasperated. He then showed me that the card I got him said, “TO MY WIFE” in great big letters on the front. My first Valentine’s Day as a wife and I was a total failure. Looking back, I think it’s really good that we have a perfect Valentine’s Day story (thanks to Nathan) and a funny Valentine’s Day story (thanks to me). May all your Valentine’s Days be memorable and full of sweet surprises like bacon covered in chocolate! so was it good? 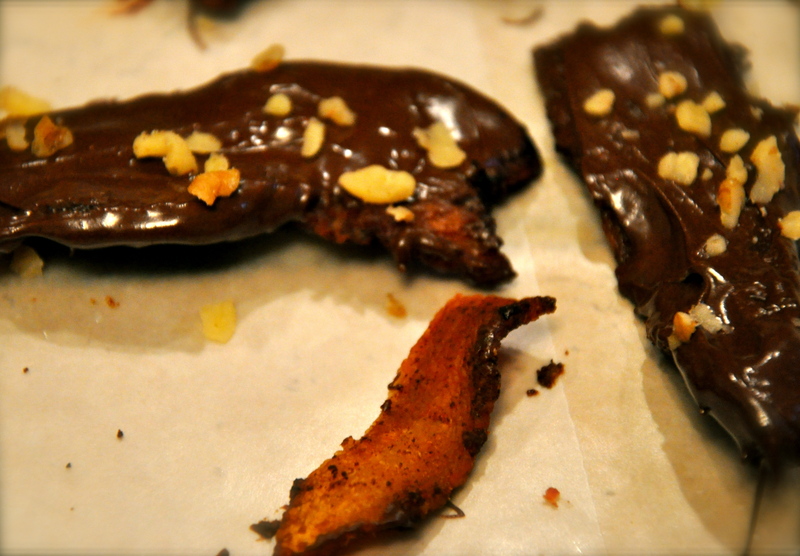 i mean, i love bacon, and i love chocolate…. but together?? you know what i like?? peanut butter sandwiches with bacon. so good. Our first vday after being married i went and bought a gourmet meal, got a babysitter for the night and made big great plans. And then i got arrested on my way home. But thats another blog. You better send me the link when you write that one!